(Mt. 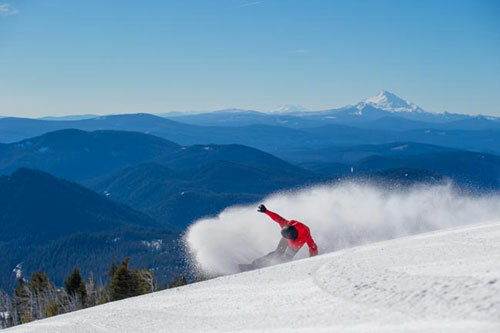 Hood, Oregon) – March has roared in like a lion in Oregon's skiing world, and recent weeks atop Mt. Hood have been astonishingly good. An astounding 103 inches of snow fell since late February and the powder has been crazy good. With a base snow depth now at almost 9 nine feet (13 feet at mid-mountain), Mt. Hood Meadows is gearing up for a crazy second half of the season. March and April continue to offer up the best the season has to offer; even though it's meteorological spring there's still plenty of winter left for your pow fix. Except now the days are getting longer leading to spring skiing in the sunshine. It's also the time of the season for events, clinics and fundraisers to make the season fun, meaningful and enriching. A whole host of happenings are coming to the mountain. The popular $25 Toyota Learn to Ride nights have been extended to March 10 and March 17, offering a two-hour Saturday evening beginner lesson for $15 and adding on a beginner lift ticket for $5 and equipment rental for $5 if needed. There are a limited number each Saturday evening so registration must be made online in advance. This is a beginner lesson program (limited to Meadows beginner lifts) for ages 6 and older. Meadows also presents a series of spring ski and snowboard adult clinics with a different focus each week, ranging from Women's workshops, Steeps Clinics, freestyle and telemarking. Three-day Spring Break camps for youth and adults are presented during Oregon (March 26 - 28) and Washington (April 2 - 4) Spring Breaks. A major signature competition returns in April: the Toyota reVEGETATE, presented by Ninkasi Brewing. Meadows' freestyle event happens April 21 – 22, attracting some of the best riding talent in the Northwest for a speed and style course and rail jam event Earth Day weekend. Competitors can win qualifying spots to reVEGETATE through the ReRack Rail Jam (March 24) and Full Sail Banked Slalom (April 7). Also coming up are the Vista Snow Shoe Tours on March 18, 25, 31 and April 15. Meadows offers a guided snow shoe tour dates from the top of its scenic Vista chairlift. The tour provides spectacular views of the Central Oregon Cascades, the White River Canyon and high alpine plant life, including the magnificent White Oak. The tour winds up with a dinner in the Alpenstube. Spring Brew Fest comes to the mountain on March 24, and the following (March 25) brings Demo Day. Two of the most popular events presented at Meadows fall back-to-back on Oregon's spring break weekend. The Spring Brew Fest features dozens of Northwest Micro Brews with a festival with live music on the Sun Deck (weather permitting). Demo Day brings in the major ski and snowboard manufacturers to get you on next year's equipment. Some ski areas wind down their season in the spring but Mt. Hood Meadows is getting all wound up for a great finish to a sensational season. Meadows Spring Passes are on sale now and become valid starting March 12 for the rest of the season. Visit SkiHood.com for updated schedule.